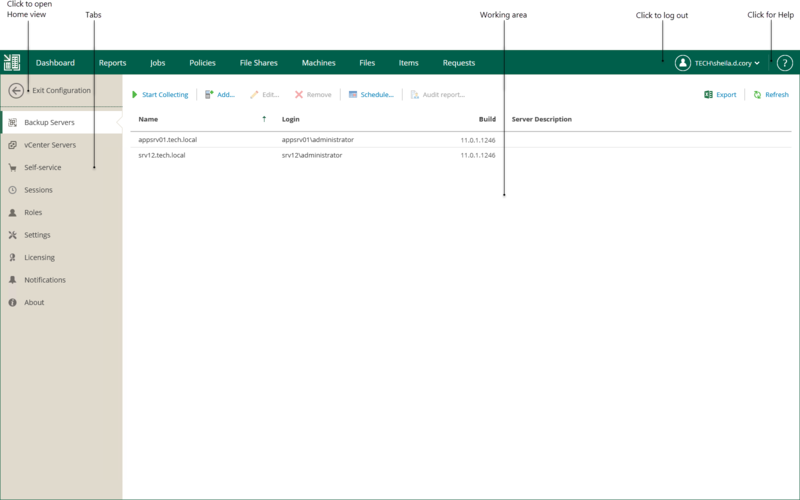 When you log in to Veeam Backup Enterprise Manager you will get to the Home view. Here you can operate your backup infrastructure with tools, that are situated within different tabs. To display on-going operations statistics for your backup infrastructure use the Dashboard tab. For more information on the Dashboard tab functionality, see Operation Statistics. 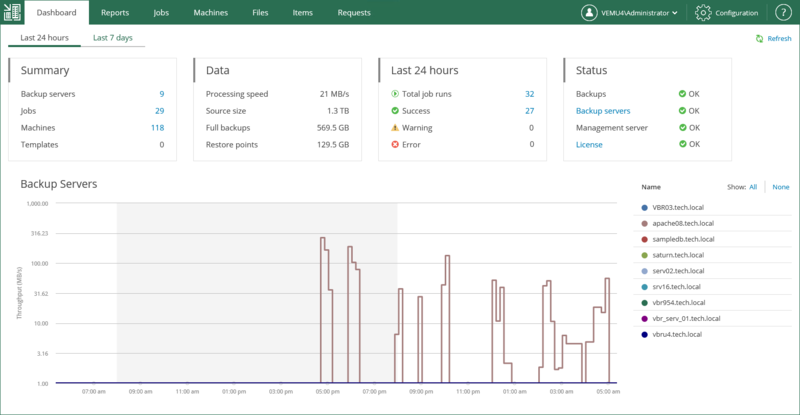 To view detailed information about Veeam backup servers managed by Enterprise Manager use the Reports tab. For more information on the Reports tab functionality, see Reports on Backup Servers. To manage jobs from all managed Veeam backup servers use the Jobs tab. For more information on the Jobs tab functionality, see Managing Backup Jobs in Veeam Enterprise Manager. To browse for machines backups, search for machines, delete machines and perform failover and replication operations with managed virtual or physical machines, use the Machines tab. For more information on the Machines tab functionality, see Working with Machines. To browse the guest OS file system in a machine backup, search for guest OS files and restore necessary files, use the Files tab. For more information on the Files tab functionality, see Restoring Guest OS Files. To perform item-level recovery from application-aware backups created by Veeam Backup & Replication, use the Items tab. For more information on the Items tab functionality, see Backup and Restore of Application Items. The tabbed pane, located on the left of the window, allows you to navigate to the configuration settings you need - for example, notifications, security roles, and others. The working area is located on the right; it allows you to view data, perform the necessary operations or manage the settings you need, as described in the corresponding sections of this guide.